Note: See my Ticket Page for detailed seat info. * Coolers must not be bigger than 14" x 14" x 7". * Bags, packs, and coolers will be checked by security when you enter the gate. * Tune your radio to 100.1 FM for race information when you are inside the speedway. The United States Grand Prix is round 10 of 18 in the World Championship. Time limit on Race: FIA rules stipulate that Formula 1 races have a maximum time limit of two hours. This race should be completed in less than two hours, barring an emergency stoppage. The F1 cars run clockwise on the oval, which is the reverse of the direction used for the Indianapolis 500 and Brickyard 400. Two infield stands ared added to the infield for the U.S.G.P. The Terrace seating, outside Turn 6 and between Turns 10 and 11, will provide one of the closest views of Formula One in the world. 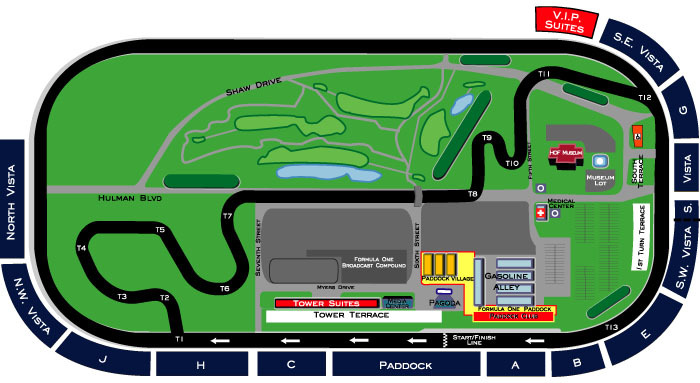 The front of the Turn 6 Terrace is approximately 50 yards from the edge of the track, and Turn 10 Terrace is even closer. 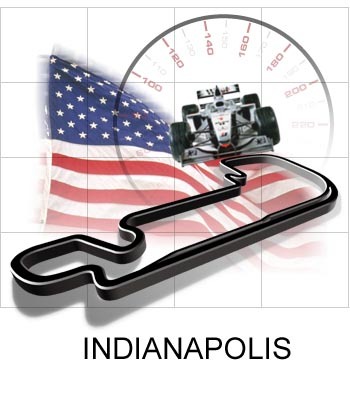 IMS hosted it's first Formula One race in 2000 to a sold-out crowd. A roadcourse was created through the infield of the historic oval for this event! 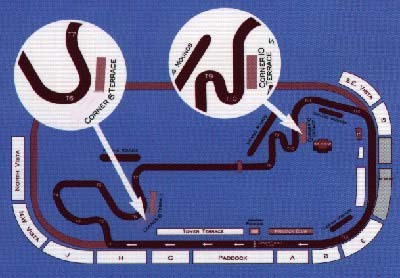 The Porsche Michelin Supercup which has held support races at the U.S. Grand Prix at Indianapolis since its inception. The Formula BMW USA replaced the Ferrari Challenge beginning in 2004. The Indycar junior series - the Indy Pro Series - began racing on the roadcourse beginning in 2005.